Ram Commercial head Robert Hegbloom visited Bobit Business Media’s offices, METRO’s parent company, to showcase the company’s latest offerings including its ProMaster and ProMaster City vans, which can now be set up with special equipment to serve paratransit fleets or other commercial customers with limited mobility. 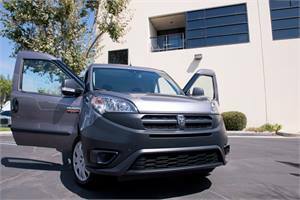 The full-size ProMaster features a locking mechanism for a wheelchair behind the driver's seat. The power driver's seat has been modified so it swivels sideways and elevates to the same level as the wheelchair to ease the transfer from the wheelchair to the seat. The ProMaster has also been equipped with hand controls for acceleration and braking, as well as rear shelving units for storage. 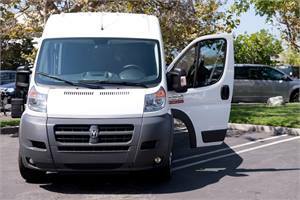 Overall, the ProMaster has up to 14 configurations available and is ideal for the shuttle bus market. The compact ProMaster City has been equipped with a rear lift for a motorized scooter, power front seats that swivel and extend out of the van to aid entry, adaptive hand controls and right-side adaptive foot controls. The rear power lift elevates the scooter and slides into the van for enclosed transportation. The upfit retains the van's second row of seating. Hegbloom said that Ram is concentrating on the private shuttle market for the ProMaster, with the private shuttle and taxi market the target for its ProMaster City. 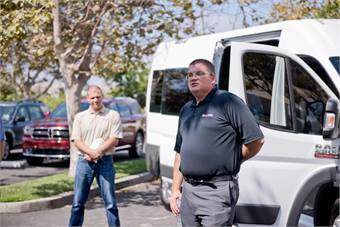 Upfitters who contributed products to the vans included MobilityWorks, Braun, EZ Lock, B&D, Veigel, and Leggett & Platt. 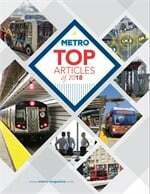 To view a photo gallery, click here.